The warm weather has been wonderful here. Not too hot during the day with lovely warm evenings and nights. I am excited to get my kids up to the mountains for a camping trip. 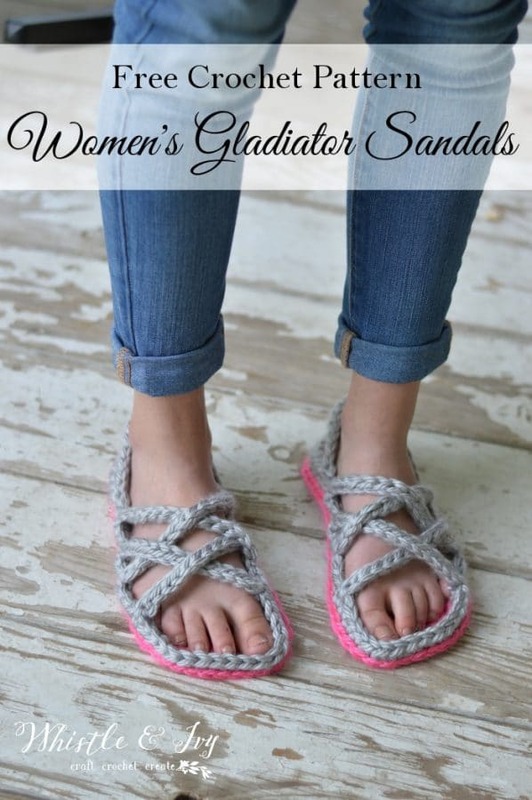 Since we have been spending so much time outside, I feel like I have been working less (which is good), but I had to work like a madwoman to get these Crochet Women’s Gladiator Sandals done this week. Luckily, they don’t take too long to make. I have decided to split a fair booth with a friend this year, and I have considered making a few pairs for my table. We will see if I can find the time! Sl st and tie off. Find the middle of the heel (with the toe oriented at the top), count 9 sts to the right. Join yarn. Ch 1. Sc in same st. Sc 17. Ch 14. Sl st in 2nd ch from hook. Sl st in each chain. Sc in next sl st on the sole. Sc 2. Ch 13. Sl st in 2nd ch from hook. Sl st in each chain. Sc in next st one sole. Sc 28. Ch 13. Sl st in 2nd ch from hook. Sl st in each chain. Sc in next st one sole. Sc 2. Ch 14. Sl st in 2nd ch from hook. Sl st in each chain. Sc in last st. Join with a sl st. Don’t tie off. Continuing high where you left off: Ch 15. Leaving ch loop on your hook, insert your hook in the st behind the bottom of the first strap, on the other side of the heel. Grab yarn and pull through making a slip st, and attaching the heel strap to the other side. Sl st in each ch, working back to the beginning. Sl st into first st. Tie off. 3. *Hdc, 2 hdc in next st* work 3 times. Sc 18. *2 sc in next st, sc in next st* work twice. 2 sc in next st. Dc. 2 dc in next st. Dc. 2 hdc in next st. Hdc 17. (58 sts) Tie off. 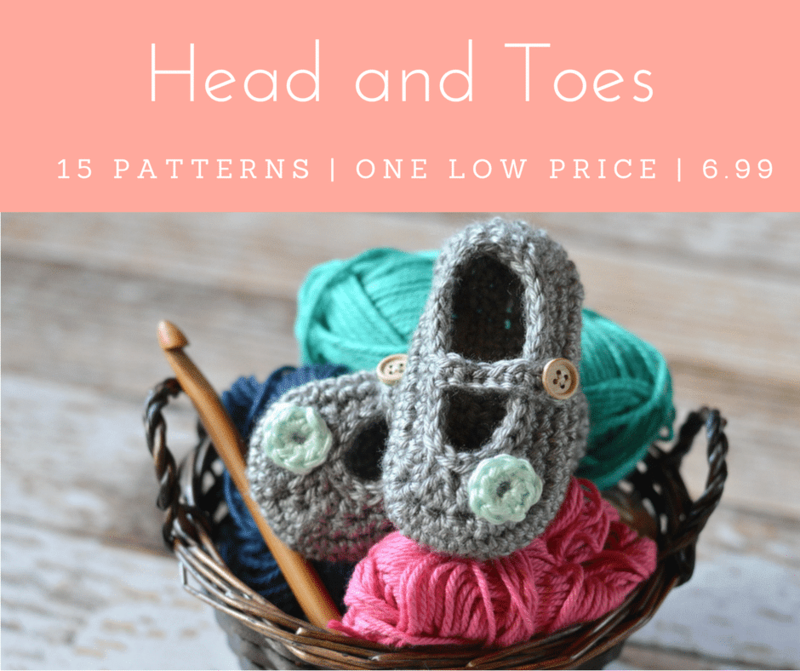 Find the middle of the heel (with the toe oriented at the top), count 10 sts to the right. Join yarn. Ch 1. Sc in same st. Sc 19. Ch 15. Sl st in 2nd ch from hook. Sl st in each chain. Sc in next sl st on the sole. Sc 2. Ch 14. Sl st in 2nd ch from hook. Sl st in each chain. Sc in next st one sole. Sc 30. Ch 14. Sl st in 2nd ch from hook. Sl st in each chain. Sc in next st one sole. Sc 2. Ch 15. Sl st in 2nd ch from hook. Sl st in each chain. Sc in last st. Join with a sl st. Don’t tie off. 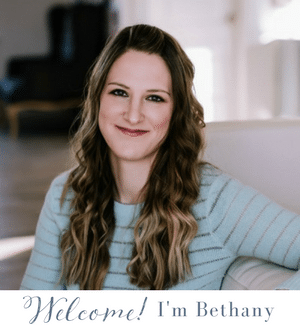 Continuing high where you left off: Ch 17. Leaving ch loop on your hook, insert your hook in the st behind the bottom of the first strap, on the other side of the heel. Grab yarn and pull through making a slip st, and attaching the heel strap to the other side. Sl st in each ch, working back to the beginning. Sl st into first st. Tie off. 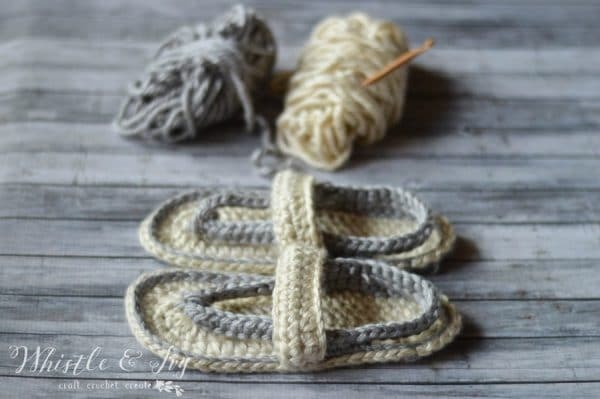 Using your hook and a length of yarn, bring it in and out through the stitch on the shoe and the end of the strap until you have a secure hold. Tie a firm knot on the inside, hiding the knot and securing your ends. Sew the bottom straps in the middle stitch, between where the top straps begin on the shoe, and where they are sewn(about 3 stitched up from the top strap). Interweave them so they go over and under (or under and over). 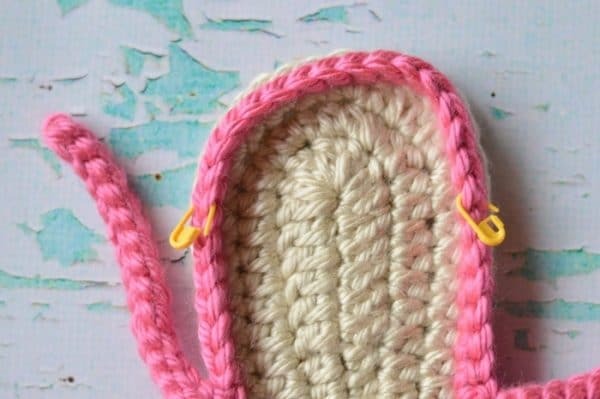 Using your hook and a length of yarn, bring it in and out through the stitch on the shoe and the end of the strap until you have a secure hold. Tie a firm knot in the inside, hiding the knot and securing your ends. Weave in all other ends. So here is the chunky version. However, I am curious, would you be interested in a medium-weight version as well? Do you have a video of making these? I’m not good at reading patterns. I love that idea!! I would love to see your finished result! 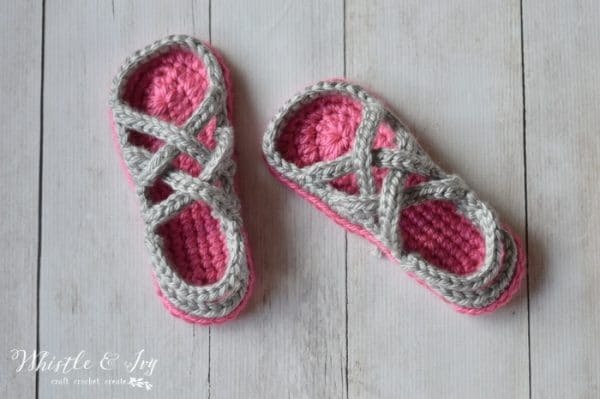 Hi, I wonder if these could be made in a smaller size as I have small feet and always have trouble finding shoes to fit, or just use a thinner yarn with a smaller hook, would that be easier than trying to change the pattern? Yes, thinner yarn would be much easier! How much smaller do you need it? Those looking for larger sizes, I haven’t tried it, but it appears, by comparing the two sets of instructions, that some instructions are 2 stitches greater, some are 1 stitch greater, others remain the same. So logic follows that the next size up should follow the same properties. Good luck! 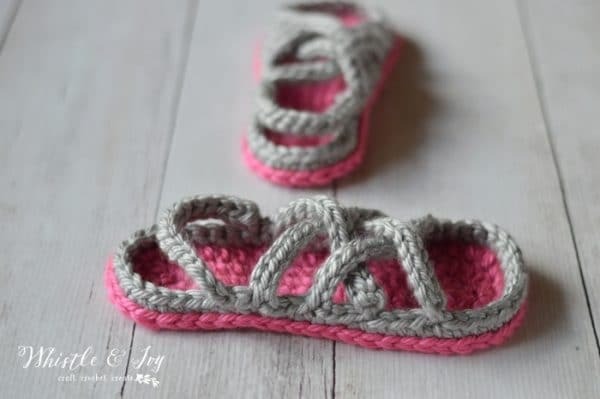 When working on body it says to single crochet 19, do I crochet towards the heel or the toe? Towards the heel. You always want the pretty “right” side of your stitches facing outwards. Yes they are US Sizing! I am not sure, how many inches would that be? Thanks, I can work it out. I did a pair of 9s last night thinking they would work and they weren’t far off. Can I check the pattern for the straps? Start in the middle of the heel, count 10 stitches and then sc 19, that gets me way up at the top of the toe.? Please share a medium weight version :) right now Im making a pair with rh with love. Im a size 7, but using size nine and just adding extra rounds. Im still keeping it 58 stitches though that way I can hack it to fit my foot. I just found this pattern through Ravelry. I am wondering how well these hold up to use. Thanks for the pattern! Mine seem to be doing well. I hope you enjoy them! Do you think holding two strands of worsted weight yarn together would work for these? I’m not sure. You can work up a swatch and see if you can meet the gauge. I would love to see a worsted weight version of these and in larger sizes as well. Thanks! Please add my interest for a worsted weight pattern. I live in the tropics and chunky yarn is not available here. I’m lucky if I can find worsted weight. Most of the yarn is baby or lace weight and occasionally sport weight. A worsted weight pattern would be great. 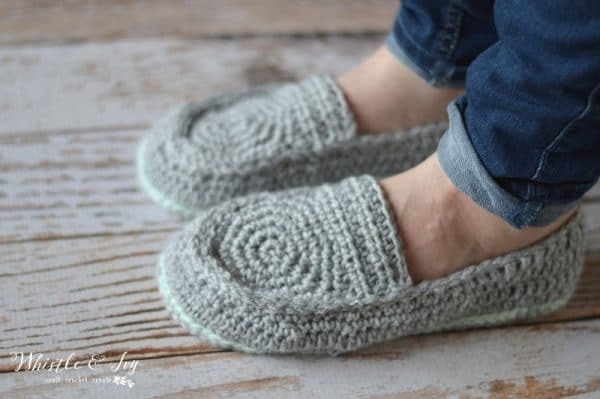 Thanks for all the great slipper patterns. I don’t need them to keep my feet warm which is why I like these sandals to cushion my feet from the tile floors.. Very, very cute! Clever pattern. Thank You for sharing your skills and passion. A medium weight would be great! I would love a worsted weight pattern!! These are super adorable!!! 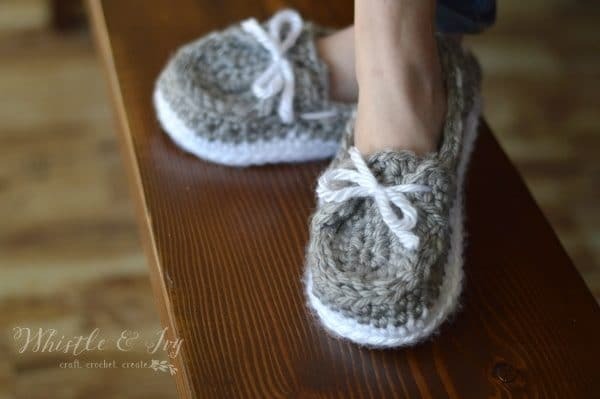 Yes, I would make them if I could make them out of worsted weight yarn! I ran out of chunky yarn along time ago, but I refuse to buy more yarn until I reduce the stash I already have! 😀 If you can, will you write the same pattern for a size 10 foot? Thanks! I like these sandals. I would be interested in a medium weight yarn version of this pattern. I also would like to ask if I can sell items that I have made with your patterns? Thank you! I will get going on a worsted option :) And YES! You may sell the item you make!